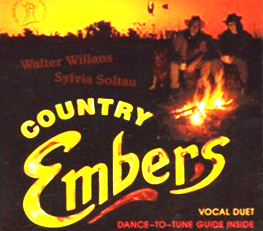 This initial CD called Country Embers is the first in a series of fine dancing CDs that reflect life in the country. The relaxing, romantic and uplifting voices of Walter Willans and Sylvia Soltau blend beautifully with the magic qualities of Walter's keyboard renditions of those golden oldies of country music. Sylvia Soltau sings her own unique composition 'Burning Embers'. Both the lyrics and the music demonstrate what world class musical people Australia produces.